Powers/Abilities: Born a mutant ("a super-being, with intellectual powers far beyond our present day understanding"), Roger was a brilliant student with an amazing scholastic record. To some degree, Roger could remotely project images into other people's minds, typically creating illusions of swarms of insects (ranging in sizes from a golf ball to a small automobile). 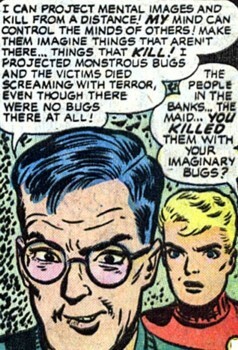 The hallucinations were so horrifyingly realistic that the victims literally died from sheer terror (unless they could convince themselves that the insects weren't real and refused to show fear). The full extent of Roger's powers is unknown. History: (Man Comics#28/3 (fb) - BTS) - Roger Carstairs was born into a wealthy family. A brilliant child, Roger always excelled academically, but was very anti-social and never had any friends. "Several years ago," Mr. Carstairs built Roger a cabin on the grounds of his estate, which Roger made into a laboratory, where the boy spent most of his time conducting experiments in seclusion. At some point, Roger learned of his true nature and extra abilities, and formed an uneasy alliance with the criminal Falseface. They would cooperate in a series of bank robberies for their mutual benefit, but Roger maintained his own agenda ("In the end, I shall destroy him, for I am destined to rule the world! I will use his stolen millions to build a new world!"). Roger used his power to frighten all the people in several banks to death, while Falseface and his gang took care of stealing the loot and hiding it in Roger's lab. With no witnesses left alive, police were baffled by the crimes, as the victims showed no signs of physical wounds on their bodies. (Man Comics#28/3) - Roger used his power again, this time at the Metro Bank & Trust. 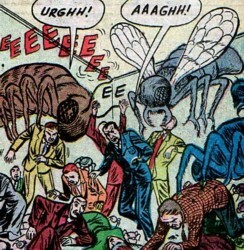 Projecting images of giant insects, Roger frightened all of the people within the building to death, and Falseface and his men made off with the cash. Meanwhile, becoming concerned about the older men Roger was associating with, and wishing to find him some "good, wholesome friends," Mr. Carstairs invited Bob Brant and his three buddies over to his estate. He took the boys to Roger's cabin to introduce them; but angered at being disturbed, Roger slammed the door on them. As Mr. Carstairs and the boys left the cabin, they saw a suspicious looking man approaching the lab, and Bob recognized him as a member of Falseface's mob (see comments). Just then, they heard a scream coming from the Carstairs mansion. They ran back, and found Lucy the maid dead, a look of absolute horror on her face (She had apparently suspected Roger of being involved in the robberies, so he eliminated her). Mr. Carstairs and the boys went back to the lab, where they were confronted by Roger, along with Falseface and his men. Roger boasted that he was "a new step up in Man's evolution, with powers you petty mortals never dreamed of," and that he had no compassion, no human emotions. Then the telepathic teenage terrorist ordered Falseface to lock his father and the Trouble-Shooters into an inner room. Once they were imprisoned, the wise American Indian Feathers surmised that Roger was a mutation, and that without compassion, he would turn his powers to evil, against a world of people he despised. Suddenly, from the corners of the room, hundreds of large bugs began to appear, and started swarming over the young heroes and Mr. Carstairs! But Bob kept his composure and reminded everyone that the crawling things weren't real, only phantoms that were the creation of Roger's mind . Together, the boys broke down the door to escape the room (Daffy: "Oogh! I can feel the bugs squash! "), but the throng of hideous insects were still being projected around them. Jumping into action, Bob and the Trouble-Shooters tackled Falseface's mob, who were also being assailed by the imaginary creatures. Meanwhile, Mr. Carstairs reluctantly realized he had to deal with his son before he destroyed the world, and so he began to choke Roger. But Falseface--angered that Roger's bugs were also attacking him and his men--fired his gun and apparently ended Roger's life. The nightmarish creepy-crawlers disappeared, as Falseface ran out the door to escape. Although it was a small consolation that he was not directly responsible for his evil son's death, a sorrowful Mr. Carstairs asked Bob and the Trouble-Shooters to keep the truth a secret ("Don't let the world know what my... my boy was!"). Comments: Created by an unknown writer and Carl Hubbel. It would seem to me that if someone has the power to create realistic illusions (and I doubt he was just limited to bugs), then faking his own death would be child's play. In the panel that shows Roger getting shot, it almost appears as though he only got winged in the shoulder. They could bring a slightly older Roger back in some "Untold Tales of the Marvel Universe" stories, maybe as an enemy for the Monster Hunters, the First Line, or the "G-Men". He thought it was his destiny to rule the world--Gotta admit, the kid's ambitious. Is it just me, or does the gawky, bespectacled, fear-inducing Roger Carstairs remind anyone else of DC's Dr. Jonathan Crane/The Scarecrow? And a BIG Thank You to The Horrors of It All for the scans! And to Ron Fredricks for the third image. The doting father of Roger Carstairs, he always thought his son to be "a strange boy," but never suspected that he was a mutant. He brought Bob Brant and the Trouble-Shooters out to his estate, all in an effort to introduce Roger to some friends his own age. When he finally saw Roger to be a threat to the world, he sadly realized he would have to take extreme measures to stop him.